Gyeongbokgung was initially built – mostly of wood and stone – just three years after the Joseon dynasty was founded in 1392. 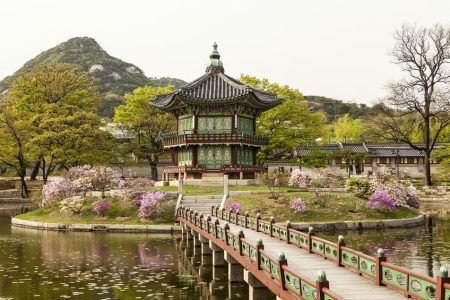 After being burnt down by the Japanese in 1592, the site lay unoccupied for over 270 years until 1967, when Regent Heungseon Daewongun ordered it to be rebuilt. Then the Japanese burned it down again after they conquered Korea in 1910, building their Government-General building in front of the throne hall. Further damage occurred during the Korean War (1950-53). In 1989 the Republic of Korea government embarked on a 40-year programme to rebuild the complex. Hyangwonjeong Pavilion dates originally from 1873. Hyangwonjeong (향원정) translates approximately as “Pavilion of Far-reaching Fragrance”. It’s built on an artificial island and is reached by a wooden bridge, the longest entirely wooden bridge built during the Joseon dynasty; the bridge was destroyed during the Korean War and rebuilt as early as 1953. The bridge is named Chwihyanggyo (취향교), “Bridge Intoxicated with Fragrance”. This entry was posted	on Sunday 27 May 2018 at 18:18	and is filed under 2018, Korea (Republic). You can follow any responses to this entry through the RSS 2.0 feed. You can leave a response, or trackback from your own site.